We present a novel nonlinear impulse sampler. 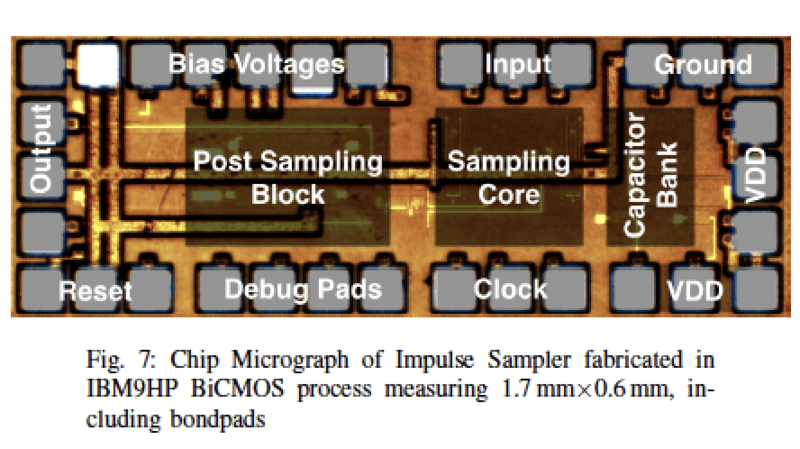 The architecture uses an ultrafast transmissionline based inductive peaking technique to turn on a high-speed sampling bipolar transistor for a few picoseconds. Our results show that the sampler can detect impulses as short as 100 ps. The chip is fabricated in IBM 9HP BiCMOS process technology and occupies an area of 1.02mm2. The power consumption of the chip is 105mW. 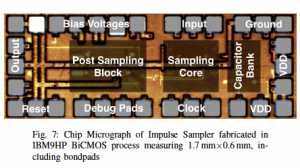 Himanshu Aggrawal, Aydin Babakhani, “A Nonlinear Impulse Sampler for Detection of Picosecond Pulses in 90 nm SiGe BiCMOS,” in proceedings of 12th European Microwave Integrated Circuits Conference (EuMIC), Nuremberg, Germany, October 2017.